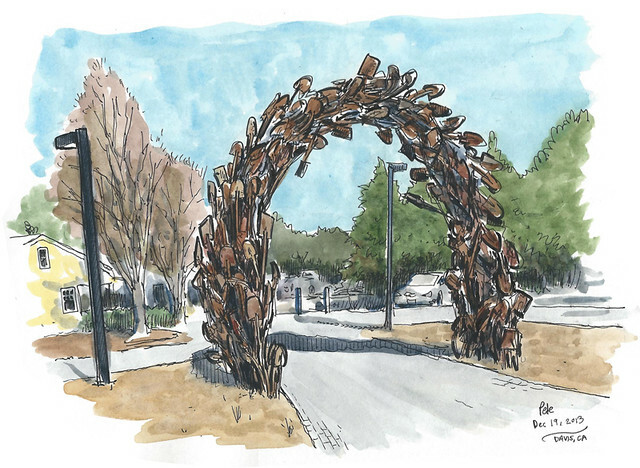 This is a quick lunchtime sketch of a new piece of public art in Davis (and there is so much new public art in Davis), located near the entrance to the Arboretum behind Davis Commons, on the bike path (yes, there are so many bike paths in Davis). A few months ago I recall the Arboretum was asking for donations of shovels (or spades as I call them), and this ultimately was the result: the Shovel Gateway. It was commissioned by the Davis Arts Council and the UC Davis Arboretum as part of the renovation of that whole area (it’s now the ‘Arboretum and Public Garden’) and was designed and built by sculptor Chris Fennell. More than 400 shovels make up the sculpture. It almost resembles a laurel wreath, and is an interesting and welcome addition to Davis’s scenery, and an opportunity for thousands of people in the coming decades to make bad jokes when they see it like, “I really dig that”. We can handle that.